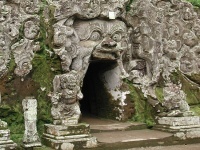 Bali is the ideal holiday destination for children. Beyond the sun-drenched beaches, there are a multitude of attractions and activities for kids of all ages to enjoy. Tourists can take the family to the Bali Butterfly Park in Tabanan, explore the Ubud Monkey Forest, or enjoy an exciting encounter with some of Bali's wildlife by taking the kids on an elephant safari to explore the Bali Elephant Safari Park of Desa Taro, north of Ubud. The wonderful forests and parks also provide plenty of open space for children to let off some steam and families to relax together. With thrilling rides, a spa, pool bar and even a food hall, the water park called Waterbom Bali is the perfect place to take the family for a day to cool off from the Balinese heat. Older kids will love rides such as the race track, the Superbowl, the Macaroni, Jungle Ride and even the Smashdown, while the younger ones will enjoy paddling round the Kiddy Park. For a seriously lazy day, families can pack the bucket and spade and head to any one of Bali's beaches to relax in the sunshine. On days when outdoor activities are not an option, kids will love a shadow puppet play - an unforgettable and unique experience.